Gules, a Saint George nimbed Or, riding a Horse trampling upon a crawling Dragon, all Argent. Interpreted coat of arms: with a rounded and pointed shape; illuminated with metals or and argent and colour gules; outlined with sable; and a watercolour finish. 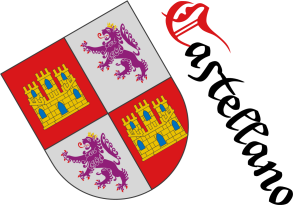 Blazon keywords: Without divisions, Gules, Saint George, Nimbed, Or, Horse, Dragon and Argent. Style keywords: Pointed and rounded, Illuminated, Outlined in sable and Watercolor. Classification: Coat of arms, Interpreted, Civic and State of Georgia. Watercolor, Pointed and rounded, Horse, Outlined in sable, Dragon, Coat of arms, State of Georgia, Georgia, Gules, Illuminated, Interpreted, Nimbed, Or, Argent, Without divisions, Civic and Saint George.